Forests have been subject to human intervention since the inception of human civilization. With enhanced knowledge, understanding and capacity humans exert an increasing pressure and influence on forests. Forests in general have undergone different ownership patterns. The requirements for forests have changed over time. The objectives of forest management are shifting from timber production to biodiversity conservation and nature protection. On the other hand, in many places the forests are dwindling due to the anthropic pressure. The management paradigms are changing in response to these triggering mechanisms. 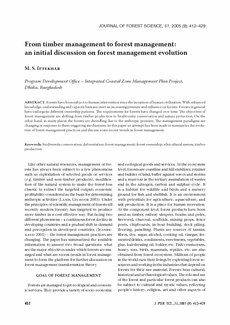 In this paper an attempt has been made to summarize the evolution of forest management practices and discuss some recent trends in forest management.